Lesser prairie-chickens are imperiled in the quest for renewable energy. On February 8, 1868, Charles Goodnight packed Oliver Loving’s corpse with powdered charcoal in a sealed tin casket and carted his dead partner 600 miles from Fort Sumner to Weatherford. The two men had fought exhaustion, Reconstruction-era rustlers and Comanche to blaze a cattle trail that created an empire and worldwide mythology. Before Loving died, he told his young partner he wished to be buried back home. For these hard-driving businessmen, Texas was more than a land of economic opportunities. Realizing the bison’s inherent worth as a part of the Great Plains, the land from which he’d made his fortune, Goodnight preserved a herd of his own. The bison’s descendants still roam the prairie at Caprock Canyons State Park. Their tales may never have survived had it not been for biographer J. Evetts Haley’s 1936 book Charles Goodnight: Cowman and Plainsman. The cattle drive stories that Haley recorded from Goodnight ended with the barbed-wire fencing of the West. But the writer’s grandson, Jeff Haley, a fifth-generation cattleman east of Pampa, now sees a new economic endeavor approaching from just over the southern horizon. As cattle drives and their ensuing ranches closed the bison’s range, wind energy may doom another Great Plains species — the lesser prairie-chicken. In May 2008, the U.S. Department of Energy issued a report outlining how wind farms could produce 20 percent of the country’s electricity by 2030. As domestic wind energy currently produces just over 1 percent of total U.S. power grid capacity, the projected goal would fuel massive industry growth, producing an estimated 180,000 new jobs. 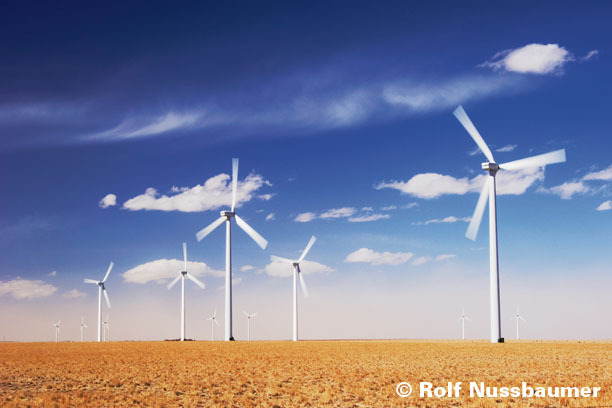 The United States is looking to the Great Plains for its wind market future. From Texas to Canada, the Midwest wind corridor is home to some of the world’s strongest and most consistent air currents. Realizing wind energy’s economic potential, Texas has been aggressive in its development. With more than 8,000 installed megawatts of wind energy, the Lone Star State has established itself as the wind corridor’s foundation. International energy companies like Shell and BP are attracted by the state’s generous tax incentives, few siting restrictions and lack of environmental regulations on development. The state government enacted legislation to create “Competitive Renewable Energy Zones,” or CREZs, to fast-track wind energy development and the construction of transmission lines necessary to move large amounts of wind energy. Lines will run from the five CREZs, located in windy West Texas and the Panhandle, to urban centers located within the Electricity Reliability Council of Texas. As the nation’s only energy grid completely contained within state borders, ERCOT enjoys substantial autonomy from federal oversight. The Texas Public Utility Commission plans for transmission line construction to begin in 2011. “Being the new kid on the block and displacing other energy sources, wind is sometimes criticized,” says Paul Sadler, a Democrat who served in the Texas House from 1991 to 2003. He now heads the Wind Coalition, a nonprofit association designed to promote wind energy development in eight states, including Texas. Sadler’s office overlooks an Austin skyline jagged with construction towers. The rapid growth of renewable energy production in Texas is a direct result of Senate Bill 7, passed by the Texas legislature in 1999 and signed by then-Governor George W. Bush. The bill established the state’s first renewable energy portfolio standard. Traditional energy generators entered into contracts with wind farm developers, kick-starting the industry and establishing a new state commodity for fiscal growth. Development has far exceeded the bill’s projected levels and is more aggressive than the federal Obama-Biden Energy Plan. Like oil and gas families with generations of wealth based on fossil fuels, property owners with good wind potential may receive royalties from energy sold. But unlike oil, a finite resource, wind can be utilized from generation to generation into perpetuity. For a dry land farmer scraping by from year to year, an extra $70,000 to $100,000 from wind energy income may mean the difference between selling and keeping the land. Even with frequently granted tax abatements, wind farms generate millions in tax revenue, benefit local school districts and create new jobs. Wind is an energy source that creates no emissions and requires virtually no water after its access roads have been built (a key issue considering the Panhandle’s depleting Ogallala Aquifer). The Texas State Data Center projects that the state’s current population will more than double by 2035. Residents will need all the energy possible. The only way to curtail energy resource development is for state residents to lessen their usage habits. While renewables receive federal production tax credits, almost all forms of energy receive federal tax incentives. A state’s diverse renewable energy portfolio holds down prices on other sources. Despite wind energy’s positive traits, the state’s lack of regulations is having unknown repercussions on its wildlife. Texas Parks and Wildlife Department (TPWD) manages the state’s fish and wildlife resources but has no formal regulatory authority over development projects. As a result, the agency must encourage wind developers to embrace voluntary siting guidelines in order to attenuate possible impacts to wildlife. In some cases, the agency has received high levels of cooperation and in others it has not. Kathy Boydston, TPWD’s program leader for the Wildlife Habitat Assessment Program, says that, at best, 40 percent of wind energy developers choose to work with her agency. Animals that have adjusted to man’s 20th-century presence suddenly have a new entity with which to deal. Aside from the turbines and their attendant roads, the Texas Public Utility Commission’s plan to build transmission lines from the CREZs to ERCOT would displace an estimated 56,000 acres and further fragment undeveloped land. Development planning may be crucial for ensuring that wildlife isn’t squeezed from remaining parcels of habitat. 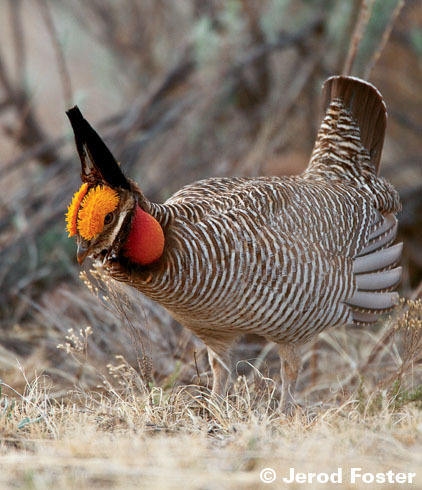 A reclusive and relatively unknown animal has been designated as the sole representative of all Panhandle species: the lesser prairie-chicken. With endangered status under consideration by the U.S. Fish and Wildlife Service, the secretive bird’s fate may have larger repercussions than most Texans realize. The Panhandle CREZs directly line up with the lesser prairie-chicken’s habitat. If the species becomes listed as threatened or endangered, changes to habitat would fall under federal jurisdiction. Wind development companies would be fined and required to purchase offset habitat for their projects. Any type of program related to a federal incentive would be affected by the lesser prairie-chicken’s listing. The lesser prairie-chicken gets no respect. Even its title is a misnomer. The “chicken” is actually a grouse, named by the Panhandle’s early settlers for its passing resemblance to a species they already recognized. The grassland nesting bird is found in small regions of Kansas, Colorado, Oklahoma, New Mexico and Texas. Like New Zealand’s kiwi and Mauritius’ extinct dodo, the lesser prairie-chicken is a geographically isolated, ground-dwelling bird. Other than the Great Plains’ short-grass prairie, the species is found nowhere else in the world. Though diminutive in size, the lesser prairie-chicken has certain traits in common with the wolves and bison that once roamed the plains. The species needs wide-open rangeland. The embattled grouse’s aversion to vertical structures like wind turbines and transmission lines could prove its death knell. A Kansas State University 2002 study found that female lesser prairie-chickens will avoid transmission lines by an average distance of 472 feet. The higher the structure, the more the grouse will avoid it. Scientists theorize that the species avoids tall structures like turbines because they equate them with trees or other places where birds of prey may perch. The CREZs call for 2,529 miles of 345 kv transmission lines to be built. The lines average in height from 115 to 150 feet. A typical wind turbine will range from 300 to 500 feet tall. Scientists hypothesize that the Panhandle lesser prairie-chicken may be affected the same as its Kansas brethren. If this is proven true, aside from the direct habitat loss from CREZ transmission line construction, an indirect loss of habitat due to avoidance will greatly decrease the grouse’s range. As the female won’t raise her clutch of six to 10 eggs near a tall vertical structure, her habitat is fragmented. Unable to find cover, the chicks are susceptible to predation. The species’ habitat becomes more confined and its genetic diversity is diminished. 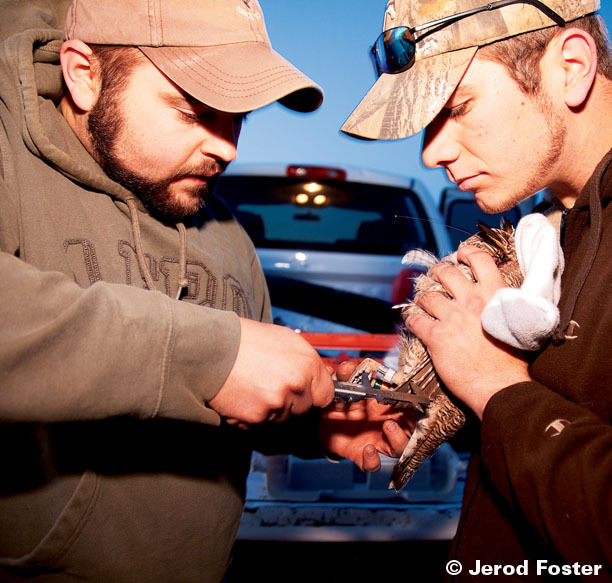 Along with fellow graduate students Nick Pirius and Adam Behney, Grisham tracks lesser prairie-chickens for TPWD and the U.S. Geological Survey Texas Cooperative Research Unit at Texas Tech University. Their 2-million-acre study site encompasses Hockley, Terry, Cochran and Yoakum counties. A vast sand dune system extends from New Mexico and runs southeast across the counties. Pump jacks toil amid the dunes’ bluestem grass, flowering yucca, shinnery oak and mesquite. Although the dunes don’t fall under the current CREZ plans, a similar study is being conducted in the Panhandle, where development would occur. In the predawn darkness, researchers hear the grouse before seeing them. The birds’ otherworldly staccato calls build. These “booms” are punctuated by their pounding feet. The researchers hear and feel these reverberations beneath their boots. The acrid smell of oil production permeates the winter air. As dawn breaks, they see the male lesser prairie-chickens performing their courtship ritual. Bent at a 90-degree angle, the male defends his territory. He displays power to try to woo a female into copulation. Yellow eye-combs give him the appearance of a furtive brow. He bleats out a call, the red esophageal air sack inflating like a balloon at the base of his neck. Red pinnae feathers rise in a distinctive V behind his head. Resembling a Native American headdress, the pinnae are often broken and worn from battles. If an adversary continues to approach, the male will attack in the hopes of driving him away. TPWD researchers have faced difficulty in calculating the grouse’s population because they’re difficult to track. Lack of knowledge about their habits, alongside wind energy’s fast development, accounts for the species’ sudden endangered listing peril. The game bird was still on the state’s hunting list until last March. Despite the species’ availability, only a few grouse were harvested in 2007 and no permits were issued in 2008. 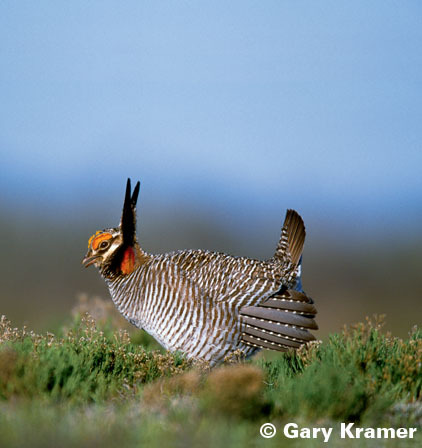 As with Goodnight’s bison, the lesser prairie-chicken is symbolic of the Great Plains. Yet the grouse remains hidden amid the plains’ shinnery oak and sand sagebrush. It is hard to feel a species’ loss when you never even knew it existed. Which begs the question: Aside from the federal impositions associated with the Endangered Species Act, why should we care about the bird at all? Ideally, wind turbines would be placed on land that is already fragmented by commercial agriculture and oil and gas production. But developers understandably build where they find the best wind and transmission potential. Iberdrola Renewables, the world’s largest wind energy provider, is taking an industry-leading step in monitoring ecological impact. Their “Avian and Bat Protection Plan” is a corporate commitment to conducting pre-construction and post-construction studies. The company reports its findings to the U.S. Fish and Wildlife Service. If a problem arises, they work with the federal agency to fix it. In Texas, which has no mandates requiring post-construction studies, Iberdrola will monitor their sites anyway. The company recently partnered with TPWD and Texas Tech University to research potential development impact on lesser prairie-chickens in Gray and Donley counties. Although no birds were found, the study will help TPWD refine their development guidelines. Haley’s Gray County ranch falls under one of the proposed CREZs. The state would have the right of eminent domain to build transmission lines over his property. More than 90 percent of land in Texas is privately owned. The fate of state species is held in the hands of landowners like Haley — men and women who balance their families’ economic needs with overseeing their property’s ecology. That balance can be as complicated as human nature. Goodnight cultivated a bison herd while simultaneously displacing the species to make room for his own cattle. In a rapidly changing society, perhaps a landowner’s best asset is knowledge. TPWD offers free land management consultation services. Wind developers like Iberdrola will inspect property and give their analysis. Independent land management agents are available to give a third opinion. For the landowner wanting to learn more about his or her property, the options are there.